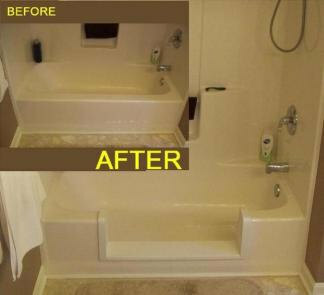 Fred Henning Bath Tub to Shower Conversion at tub2shower.net - Economical, reliable, & less than one day turnaround. Insert can be temporary or permanent as it is completely reversible. Cutout can be easily reinstalled if no longer needed. Steel and cast iron tubs will require welding and reglazing. The finished product is completely seamless and you can't even tell the tub had been modified. Each insert is custom built to fit YOUR tub with a tight, neat, waterproof fit. PVC insert is laser cut, heat formed and welded off site to keep the mess & smells out of your house! And It Is Completely Reversible ! ! This is a steel tub converted to a walk-in shower in 1995.
tell that it was ever modified!